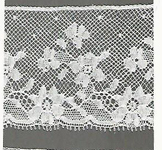 Venetian (Bridal) Lace and Cotton French Lace. These are special order items and may take 1-2 weeks to ship. The French lace is 100 percent cotton. The Venetian lace is made of 100 percent rayon and comes in exqusite colors!